Executive Mosaic’s GovCon Index posted its biggest one-day decline in a month Thursday with services and industrial components the largest drags in a session that saw U.S. equities struggle for clear direction as investors looked for more clarity on President Donald Trump’s economic agenda. GovCon Index decliners outnumbered advancers by a 5-to-1 ratio as only two of its 11 S&P 500 components registered a gain with co-listed stock Boeing (NYSE: BA) the GCI’s top net performer overall and ManTech International (Nasdaq: MANT) the biggest laggard. ManTech led all decliners at a tumble more than $4.00 after the government services contractor issued 2017 earnings and revenue guidance with both midpoints below the consensus Wall Street analyst forecast. Fellow services-oriented company CACI International (NYSE: CACI) fell $3.00 to end as the GCI’s second-largest laggard and was followed by L3 Technologies (NYSE: LLL) at a $2.00 loss. 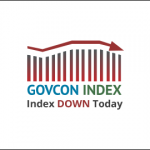 Six other GovCon Index companies shed at least $1.00 each: AECOM (NYSE: ACM), General Dynamics (NYSE: GD), Orbital ATK (NYSE: OA), Cubic Corp. (NYSE: CUB), Textron (NYSE: TXT) and Lockheed Martin (NYSE: LMT). Northrop Grumman (NYSE: NOC) ended second-best behind Boeing for gainers with BAE Systems (U.S. over-the-counter), Rockwell Collins (NYSE: COL) and Maximus (NYSE: MMS). Industrial shares fell 0.77 percent to lead five major S&P sectors lower with utilities up 1.05 percent as the best performer among the remaining six.